I introduced this challenge to encourage people stay away from their screens for a few hours every week. What if a person does not need the encouragement but had to find an alternative for one little thing in her life away from the screen? She reviews books at Book and Ink. If you would like new book suggestions or would like a book to be reviewed do visit her page and do ping her. So here you go, Shree Janani writes about how a day without her phone made her realize how she was dependent on it for one thing. My day typically starts with a sleepy me checking my task list on my phone. Yes, I’m one of those people who religiously keep a digital task list for the day. The list has pointers (or links) to bills that I have to pay or probably grocery that I have to order or mails that I have to send and what not. Given that I multi task a lot these days, maintaining a digital to-do list seemed to be a sane idea. If you loot my phone, you can probably even hatch an accurate plot to kill me. Yes, I’m that meticulous when it comes to executing that task list. One fine day, my phone decided to talk a nap. It ended up being more than a nap, it died a mighty death. Of course, I did have a backup of my lists on the cloud, but then I missed my phone. That was the day I realized how dependent I had become on a gadget. 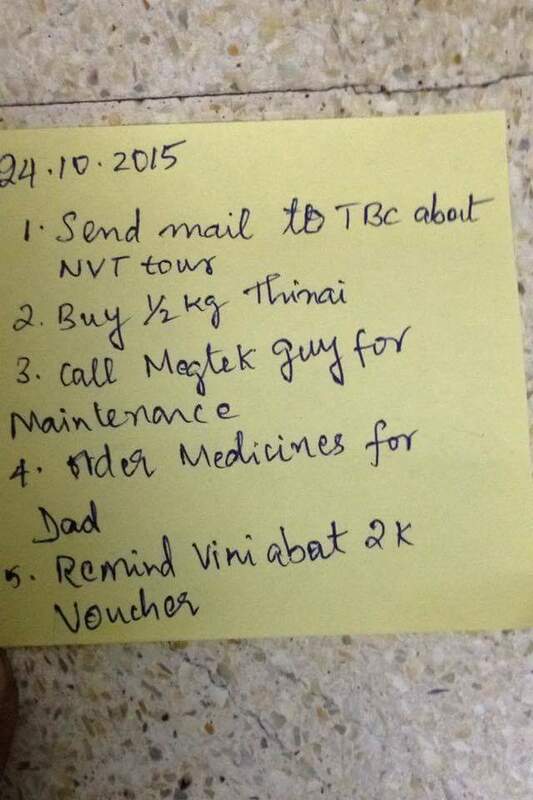 I decided to bring back my old habit of making a “to-do” list and sticking it to the fridge. Of course, that decision didn’t go well with my mum as she believes that a fridge should be used only for cold storage. The digital list of course had its own advantages. It kept reminding periodically to execute the tasks that I had planned. When I lost my phone, I realized I had almost stopped using a beautiful storage device that god had blessed me with – my brain. I started preparing equally meticulous hand written post it notes and found a trick to remember the list to execute my plans to dot. I did find it difficult initially but as days passed I fell into the routine. It’s been a year since I have gone screen free in mornings! Given that my idea of entertainment is books, I’m not really that addicted to “the screen”. But this was one habit that I was determined to get rid of and I successfully managed to. ← When the ‘Other Woman’ is Football!